Nicole Pannullo is among 211 undergraduates from across the nation to be recognized as Barry Goldwater Scholars. It is the highest undergraduate award of its kind for the fields of the natural sciences, math and engineering. A student at Rochester Institute of Technology’s National Technical Institute for the Deaf, Nicole Pannullo, is among 211 undergraduates from across the nation to be recognized as Barry Goldwater Scholars. It is the highest undergraduate award of its kind for the fields of the natural sciences, math and engineering. Pannullo is the first hard-of-hearing RIT student to earn the prestigious award. She is a biochemistry major and research scholar in the College of Science from East Patchogue, N.Y. Counting Pannullo as this year’s Goldwater winner, RIT has had 35 recipients and honorable mentions since 2005. 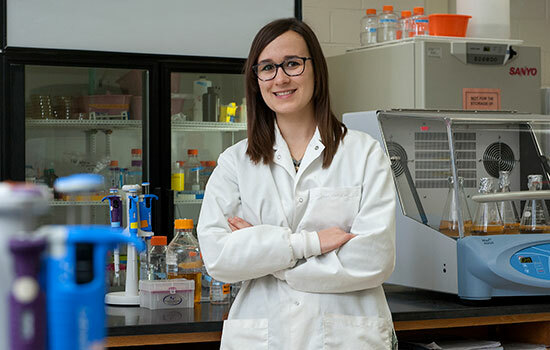 Her current research project title is “Probing the Two Orientations of Pal in Vesiculating E. coli,” and her career goal is to obtain a Ph.D. in regenerative medicine and pursue a research career developing therapies for genetic disorders, preferably retinal diseases that have limited treatment options. Her mentors include Lea Vacca Michel, associate professor in the School of Chemistry and Materials Science, RIT’s College of Science; Thomas Michael Redmond, section chief, and Eugenia Poliakov, staff scientist, National Eye Institute’s Laboratory of Retinal Cell and Molecular Biology; Todd Pagano, professor of chemistry and associate dean for Teaching and Scholarship at NTID; and Morgan Bida ’07, ’03, analytical instrumentation specialist in NTID’s science and mathematics department. The scholarship recognizes exceptional college sophomores and juniors across the nation. This year, awardees were selected from a field of 1,280 undergraduates and were nominated by campus representatives from among 2,000 colleges and universities nationwide. They will receive up to $7,500 toward the cost of tuition, fees, books and room and board. Of this year’s Goldwater Scholars, 29 are mathematics and computer science majors, 142 are majoring in the natural sciences, and 40 are majoring in engineering. Many are majoring in a combination of mathematics, science, engineering and computer science. The scholarship honoring U.S. Sen. Barry Goldwater was designed to encourage outstanding students to pursue careers in the fields of mathematics, natural sciences and engineering. Since its first award in 1989, the Foundation has bestowed 8,132 scholarships worth approximately $65 million.